That's how I feel about the new rebooted Ghostbusters. If you accept it as it's own thing you'll probably enjoy it more. If you're looking for something that captures the more cynical humor and character relationships of the 1984 film, you won't find it here. It is definitely a funny, more cartoon like film with laugh out loud moments. It's not particularly scary but, let's face it, neither were the original two films. Just don't go into the film with the mind set of comparing every moment to its predecessors to see which does it better. The original will win every time (as it should, so why waste your time and ruin your enjoyment of the new film? Use the time to spot all the Easter eggs and callbacks and nerd out on those instead). I enjoyed the new cast, particularly Kate McKinnon as the teams hardware specialist, Jillian Holtzmann. Her character is a lot of fun introducing and developing all the tech. Unfortunately she is used to insert random site gags in places, pushing for additional laughs for no real reason other than to add a few more jokes to the movie. Not a bad thing by any means but it's always nicer if the humor is a direct result of the story moving forward. Kate McKinnon as Jillian Holtzmann. Kristen Wiig, Melissa McCarthy and Leslie Jones all hold their own as valuable contributors to the team. Kristen and Melissa's characters are the Bill Murray and Dan Aykroyd members of the team respectively but their dynamic is very different. Where Bill's character was kind of a cool but cynical guy practising science as a sort of lark, Kristen's character is the real deal. She's a real scientist trying to score credibility and prestige whilst distancing herself from her earlier research into the paranormal. Once she realises her earlier research wasn't all for nought she loses any ability to be reluctant or cynical about the work Melissa's character is doing. As such it's a more positive relationship. Chris Hemsworth role as the team's receptionist, Kevin, provides some good laughs. From the trailers it's hard to understand why they would hire a receptionist so stupid (aside from the eye candy factor) but there is further explanation that makes some sense. My only issue with Kevin is that, from out of nowhere, he decides to make himself a team member (not really a spoiler if you've seen the trailers) rather than the team's receptionist. It makes me think there's a few scenes that got cut that would have explained this better. Leslie Jones' character, Patty, kind of muscles her way onto the team then a short time later is lamenting her decision as if it wasn't her choice in the first place. Which also makes me think a few deleted scenes must be around that explain this better. In fact, my only real issue with the film is that it doesn't clearly show the passage of time in several places. For example, in one scene the team are being questioned by the Mayor after having caught first ghost (I think), immediately after that they are in an alley way trying out a bunch of new equipment that they didn't have available what seems like hours earlier, until you realise the alley is not the one next to the Mayor's office but the one next to the Chinese take-a-way and it's probably days or maybe even weeks later (given the amount of new equipment). This kind of unacknowledged passage of time jump happens a few times through out the film. Most notably it goes from day to night very quickly during the climactic Ghost battle at the end of the film. It may be because of a dark cloud that forms over the city but it's not totally clear. One minute it's day the next it's night. Aside from that, I enjoyed the film. It's not a movie I'd particularly want to see multiple viewings but if there are sequels, I'd certainly look forward to seeing those. In fact, now they're over the 'origin' story, a second movie could certainly do a lot to improve upon a fairly solid start. It would be particularly good if the next film had nothing to do with opening a city destroying portal of paranormal activity (come on... three films in a row now). 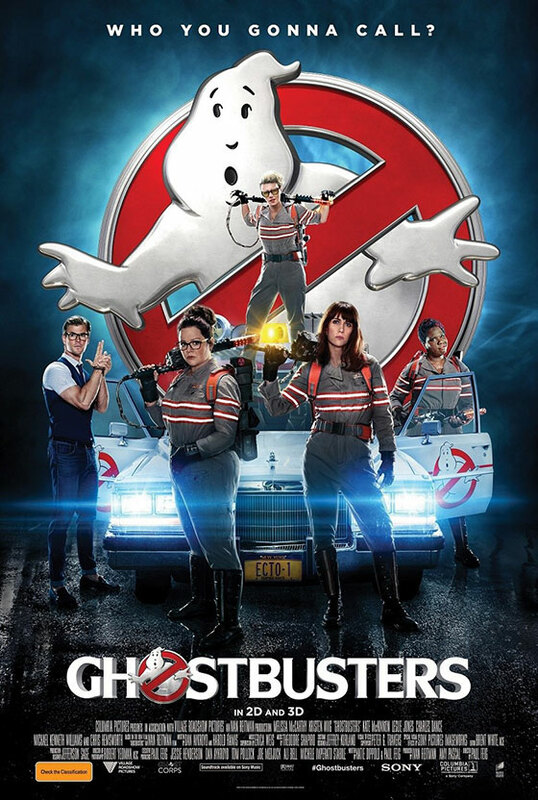 To sum up, this is not the 1984 Ghostbuster movie. It really is its own thing. If you can go into it with that in mind, you will probably have a better time. The fact that it's an all female team really makes very little difference - other than they have a penchant for dancing a bit more than your average male scientist might. Then again, the original cast did their fair share of dancing in Ray Parker Junior's video for the Ghostbusters theme song. This movie is not bad, like some would want you to believe. It's not a chick flick just because it's an all female team. It's definitely not a male bashing film either. The special effects are not hokey or dated (as I've seen some say). It's a comedy as good as any I've seen in recent years. It's not outstandingly great but it is Ghostbusters for a new generation. I really hope they at least try for a second movie in this series. I don't think I'll go and see it. Can't remember how the story went with the original but would probably prefer it. Hope the young ones will see the original too, if they haven't already. Usually the one you see first is usually the one you prefer. As I say above this movie is it's own thing so whilst the story is sort of similar to the original it has its own origins for how the team evolves. It's not a remake just a reboot of the Ghostbusters concept. You'll hear the original theme song played very early on in the movie and you'll also hear other people's versions and remixes later on. I looked at the soundtrack to this film and, along with the original theme song, there's at least 3 or 4 new versions of the same song.